Halwa is a traditional UP dish that is sweet but not necessarily a dessert. It can be a breakfast for some, yes in the older days it was a quick dish to make on stove tops and was almost equivalent to the cakes we bake today in fancy ovens. I say cakes because of the ghee that goes into traditionally made Halwa that is only comparable to a cake and not a cereal breakfast. If the content of ghee is lesser, a halwa can be a cereal breakfast in it's composition. Halwa is definitely not a breakfast dish anymore in our adult lives, with our butts stuck to the chairs all day, but in the childhood days halwa and jalebi was a happy note to start the day on most weekends. Going by what my mother in law tells me, she used to pack halwa and poori in Arvind's lunch box often. I know where his love for halwa and all things sweet comes from. I have to make some halwa every now and then, making just one serving is my solution as I don't like it much and can eat only 2-3 tea spoonfuls at a time. Heat the ghee in a deep pan and tip in the flour into it. Keep stirring on low heat till the flour starts getting aromatic and changes color to pinkish brown. This takes about 5-8 minutes for this quantity. If making a larger quantity, halwa can be a work for 40 odd minutes, I have made halwa for family get togethers and the aroma of roasting flour makes everyone hungry while the halwa takes it's own sweet time to get made. Once ready it pleases everyone. Ad the sugar once the flour becomes nicely browned, and let the sugar crystals become caramalised a bit. It will start getting sticky after a couple of minutes. If making large quantity, it may take another 10 minutes. So as soon as the sugar crystals start getting sticky, add the water in a gentle stream. and mixing the halwa mixture steadily, using a spatula with the other hand. The halwa comes together and becomes like a shining dough, keep stirring it till it starts getting a bit crumbly by further dehydrating. Add chopped nuts, roasted or fried if you wish, mix well and serve hot. Halwa is never served cold unless it is a carrot or pumpkin halwa. It can be a nice quick snack if you have a sweet tooth. 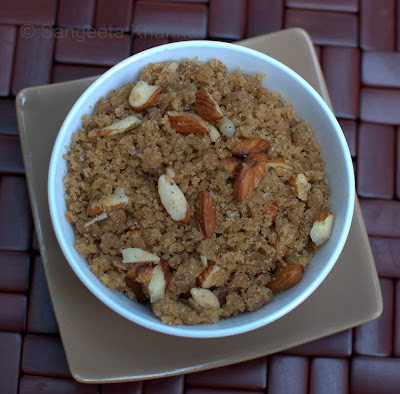 This kind of dryish crumbly halwa is great with hot milk for breakfast as well. Some people like it a little wet, you would have to not dehydrate it while cooking after adding water in that case. Making a small amount of halwa is not very tricky and you can always make some for your kids instead of those store bought muffins or biscuits. It is a high calorie and high carb dish but healthier than many of the ready packed food that we hand out to our kids mindlessly. I have posted an instant besan ka halwa made in microwave and a kadhai made besan ka halwa too. Go have a look if you want besan ka halwa. 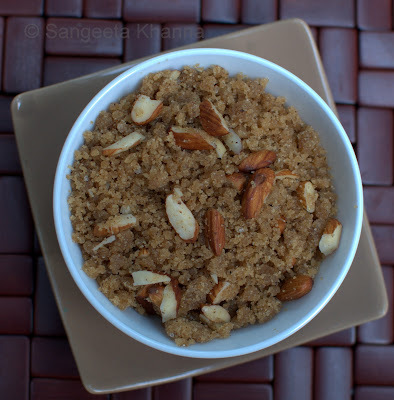 A step by step mung ka halwa recipe is also posted if you have some time to indulge. Now you know how much loved is halwa at my place. You know what, I started getting that aroma of halwa being made while typing this. I don't like halwa much but that aroma is one of the favorite food aromas for me. Tell me when are you going to make some halwa for your loved ones? The link to moong malwa, doesn't contain any photographs ( I can only see white exclamation marks, in a black background). Could you please look into this ?